Do employees prefer a structured leave environment? Recently we talked about companies offering their staff an unlimited holiday allowance, but this isn’t always the best approach for businesses. Many organisations find that their employees actually want the structure of having an exact holiday entitlement, and knowing they are on an equal footing with their colleagues. One of the challenges of unlimited leave is that staff can potentially request large chunks of time off at any point in the year, leaving their colleagues in the lurch. By setting an annual leave limit, your company enables team members to structure their days off throughout the year, so they get the benefit of time off without disadvantaging their co-workers. 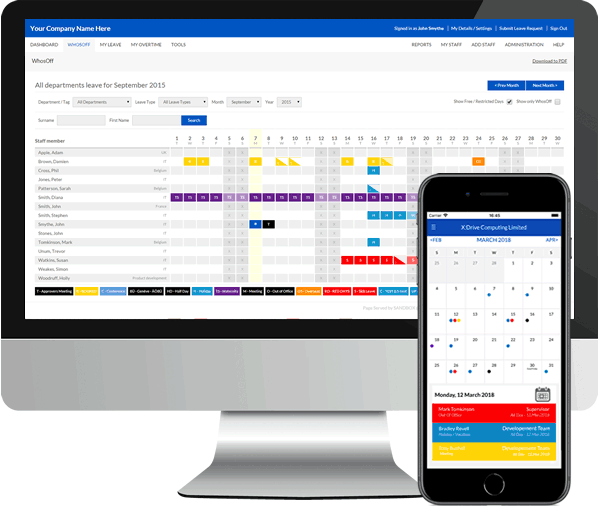 In addition, if you have a good leave management platform in place, staff can log on and see at a glance exactly how much holiday they have left to take. And if you put a minimum notice period for making holiday request in place, this encourages team members to use the platform in order to see who’s already booked leave before they ask for time off. If your business has a middle management team, unlimited holiday can be a real headache for them. It’s much harder to control who’s off when staff can effectively take as much leave as they please. Another reason that employees like formalised leave environments is that they know exactly when their holiday year starts and ends. This also provides your company with an opportunity to set clear guidelines about whether outstanding holiday can be carried over to the following year, or if it has to be used up within those 12 months. With a policy in place and an online platform for workers to check how much holiday they have taken, staff can take full advantage of a ‘use it or lose it’ approach to leave entitlement and not get caught out at the end of the year. Structuring your leave environment doesn’t necessarily mean offering the statutory number of holidays; you may want to increase your package to create a more attractive ‘perks’ package to your competitors. This package may include long service incentives that encourage staff to stay loyal to your business. Some companies offer extra days’ holiday for every year that an employee remains with their company (up to a maximum limit); others give team members a bonus week after five or 10 years of service. Again, leave management software makes it much easier to track this entitlement, as individual holiday allocations can be set for each member of staff. This will automatically calculate remaining leave still to take, rather than managers or HR staff having to individually manage each worker’s allowance. Just because your organisation decides to set a limit on annual leave, doesn’t mean the structure you put in place has to be dictated to your workforce. In fact, many employers enjoy incorporating wider team members in their discussions when formulating their holiday plans. Being involved in the development process helps employees at all levels feel valued by your business, and they are more likely to positively receive the structure you put in place. And if you onboard leave management software to roll out this new approach, you can easily put your guidelines into practice. Streamline the way your business manages staff leave with WhosOff. Request a free trial to see how our online dashboard enables your team to track leave, view who else is out of the office and make holiday requests. Title: Do employees prefer a structured leave environment? Should you offer employees unlimited holiday? Companies are always looking out for new ways to attract and incentivise staff, and these perks don’t always have to be connected to salary. In the past few years we’ve seen a growing trend towards businesses giving their staff more paid leave – and some have even started offering unlimited holiday. New European ruling on carrying over leave: what does this mean for your business? The European Court of Justice has made a landmark ruling on employees’ rights to carry over annual leave, and whether workers should be paid for holiday they haven’t taken in previous years when their employment ends. The countdown to Christmas has begun, and it’s not just families who should be preparing for the big day. As a business owner or manager, you need to be ahead of the game when it comes to scheduling staff leave during the festive period – so that everything runs smoothly, even with a skeleton workforce.